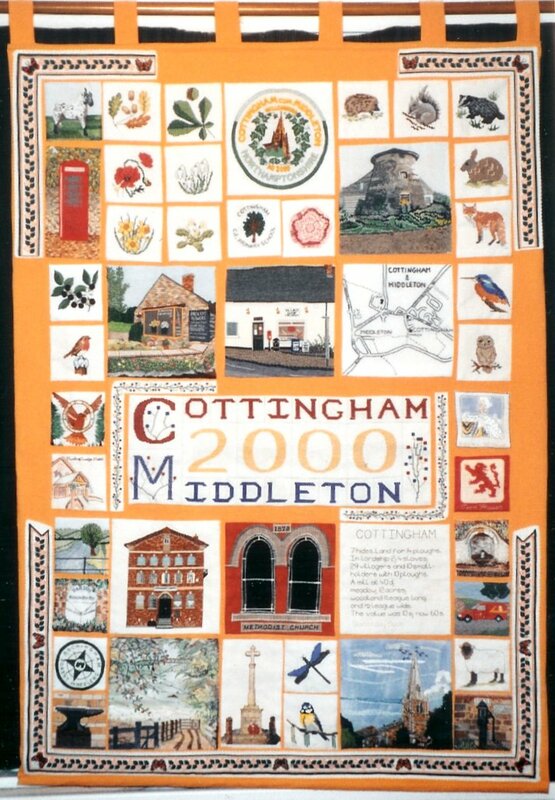 The Cottingham and Middleton Millennium wallhanging is an exquisitely embroidered tapestry depicting various aspects of village life at the turn of the Millennium including buildings, landmarks, flora and fauna. Organised by Diana Sharvill, the wallhanging was created by more than 40 Cottingham and Middleton villagers including youngsters from Cottingham School who each completed individual letters and numbers for the central section. The wallhanging is now displayed in the Village Hall Annex. Hold your mouse over the sections of the wallhanging below to find out more about each item and the people who stitched them.